To Cite: Fatahi Asl J , Shirbandi K, Naghashpour M , Jahangiri Mehr F . Medical Interns’ and Residents’ Awareness of Radiation Protection in Pediatric Diagnostic Imaging, Jentashapir J Health Res. 2018 ; 9(3):e66932. doi: 10.5812/jjhr.66932. Background: The exposure of patients and radiation workers to ionizing radiation is evaluated in most cases on the basis of risk versus benefit. Any unnecessary exposure of the entire community is an unacceptable risk. Objectives: The purpose of this paper was to assess medical interns and residents’ awareness of radiation protection in pediatric diagnostic imaging. Methods: This descriptive cross-sectional study was conducted on 270 medical interns and residents. Data collection was done using a questionnaire prepared according to a literature review, with confirmed validity and reliability. After collecting and scoring the questionnaires, the data were extracted and analyzed by descriptive statistics, independent t-test, and Pearson’s correlation coefficient. Results: The participants’ awareness of pediatric diagnostic imaging was 75.55% and awareness of the principles of biological effects of radiation was 62%. 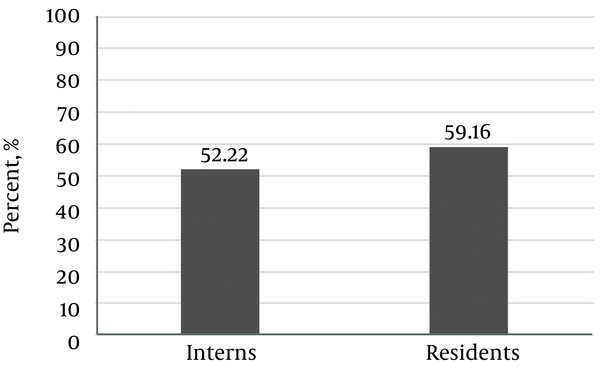 There was a significant difference between the awareness of residents (59.16%) and that of interns (52.22%) (P = 0.01). The results for the two groups also showed that there was a significant difference between the level of knowledge about the dose received during imaging in both male and female groups (P = 0.04). Conclusions: Based on the results, in order to reduce children’s exposure to radiation, it is recommended to enhance the awareness and knowledge of general and specialized medical students at universities and hospitals through retraining courses. Copyright © 2018, Jentashapir Journal of Health Research. This is an open-access article distributed under the terms of the Creative Commons Attribution-NonCommercial 4.0 International License (http://creativecommons.org/licenses/by-nc/4.0/) which permits copy and redistribute the material just in noncommercial usages, provided the original work is properly cited. Nowadays, ionizing radiation plays an important role as a diagnostic tool in the treatment of diseases and is being updated day by day, making its scope broader than ever before (1, 2). The exposure of patients and radiation workers to ionizing radiation is evaluated in most cases on the basis of risk versus benefit (3). Any unnecessary exposure of the entire community is an unacceptable risk. Ionizing radiation, especially in radiography, can have biological effects on both patients and radiation workers, when exposed to radiation, and these effects could be short-term (definite), long-term (probable), or genetic (4). Therefore, to avoid unnecessary radiation and the risks from ionizing radiation, there are radiation protection standards, based on which unnecessary use of these beams is prohibited in the first place, and the necessary uses of ionizing radiation without observing the protection principles and rules will bring about more risks and losses than avoiding the use of radiation (5). According to the regulations approved by the International Commission on Radiological Protection (ICRP) and National Commission on Radiological Protection (NCRP), an ionizing radiation test or therapy should be justified for the patient and be used in a manner, by which the patient and the radiation worker are exposed to the lowest possible level of radiation (5). To this aim, one of the protection programs abbreviated as ALARA (as low as reasonably achievable) has been placed forward for the protection of patients, radiation workers, and the entire community against radiation. Based on this principle, a risk is highly linear and without any threshold (6). All individuals, with no exception, are constantly and naturally exposed to ionizing radiation, which is called background radiation. Various sources of background radiation, affect cells and tissues from outside or inside the body (7). According to the ICRP Act, an effective dose is a quantity that respects biological effects of various types of tissue in addition to the biological effects of a variety of beams (8). The most important issue for ordinary people in the community is protecting them from the risks and genetic waste of ionizing radiation, which is underlined by the rules and regulations of national and international associations, to reach a further reduction of the genetic dose. In diagnostic radiography, the goal is to draw conclusions with the help of imaging, which is worthwhile in protecting the health of the patient far more than the risk of radiation (9). Those, who are at the greatest risk of X-rays are children and pregnant females (10). Since the level of knowledge of physicians and those involved in diagnostic tests, using ionizing radiation for children is unclear, the purpose of this paper was to assess the awareness of medical interns and residents of pediatric diagnostic imaging. In this descriptive cross-sectional study, a questionnaire addressing radiation effects on the body of living organisms and the principles of protection against radiation was distributed among medical interns and residents at university hospitals of Ahvaz Jundishapur University of Medical Sciences. The research plan was approved by the Ethics Committee of Ahvaz Jundishapur University, with the ethical code of IR.AJUMS.REC.1393.170. The questionnaires were distributed among 300 medical residents and interns, between 7th and 22nd of June 2016. The questionnaire consisted of 15 questions on different topics (supplementary file Appendix 1), which were based on previous studies and verified by the faculty members of the Radiology Technology Department of Ahvaz Jundishapur University of Medical Sciences (11, 12). It dealt with a general understanding of the community’s awareness of the concepts of radiation protection and the associated risks in conventional pediatric imaging. The questionnaire consists of two parts. The first part was dedicated to demographic information while the second part involves questions about radiation, during pediatric imaging. The demographic information section consists of three parts (age, gender, and degree of education). In the second part of the questionnaire, questions regarding the absorbed dose, the most sensitive limb for radiation, and the risks of computerized tomography (CT) for children, as a factor for future cancer, were included. The scoring was as follows: correct answers) one, wrong answers) zero, and unanswered questions) two. The reliability of the questionnaire was verified by the SPSS software, using Cronbach’s alpha coefficient (α = 0.78). After collecting and scoring the questionnaires, the data were extracted and analyzed using SPSS software and descriptive statistics, independent t-test, and Pearson correlation coefficient. A total of 300 medical interns and residents completed 270 questionnaires (90%) and 30 questionnaires were excluded. Out of these 270 individuals, 170 females and 100 males with a mean age of 29.1 ± 5.37 (63% and 37%, respectively) constituted the total population (Table 1). The participants’ awareness of the effects of ionizing radiation on body organs was 60.4%. The results also showed that awareness of the principles and rules of protection was 24.4%. Among the respondents, 15.9% did not recognize the non-ionizing nature of the magnetic resonance imaging (MRI) test. Considering the advent of CT scan tests and the induction of cancer by abdominal CT (13, 14), 51.5% of the respondents did not know the risk of this test compared to other diagnostic tests. About two-thirds (62%) of the physicians were reported to be aware of the principles of biological effects of radiation. The results of t-test for two independent groups indicated that there was a significant difference between the level of knowledge of the principles of biological effects of radiation in two groups of general practitioners and specialists (P = 0.01). The percentage of correct answers to questions in each group is shown in Figure 2 and Table 2. About three-fourths (74.58%) of the participants stated that they were trained in radiation protection through education at universities and hospitals, and 78.6% by attending pediatric care conferences and workshops. When performing a diagnostic test, 55.9% of the respondents informed their patients about the side effects of radiation. In addition, there was a significant difference in the level of awareness of pediatric diagnostic imaging between male and female participants (by gender) (P = 0.04). Physicians’ awareness of diagnostic tests for patients is important because they are directly involved in the patient’s imaging. The radiation of the patients is often performed by X-ray diagnostic imaging, and by avoiding unnecessary imaging and repeated imaging tests by training, through which the amount of the radiation received by patients is reduced. The results of this study indicate that the amount of physicians’ knowledge is not the same in different fields of imaging. That is, 26.7% of the participants had no idea of the absorbed dose and 58.9% stated that a CT scan test in childhood increases the risk of cancer. Today, with the advent of CT scan devices and their new generation, ‘multislice’ CT has more doses than previous generations (15). However, 45.6% of physicians responded correctly to this question. The concept of ALARA is considered as a principle in imaging tests, according to which any imaging of children should be justified in terms of justification and, in fact, the benefit of the test is greater than its risk. Therefore, physicians need to be aware of the risks of each imaging, so they can prescribe the best and safest diagnosis to reduce injuries to the patient. According to this study, the statistical population did not have enough awareness of this principle, and only 24.4% of the community were aware of this principle. In the study of Salerno et al. (16), 27% of the community was aware of this principle, which is similar to the current study in this regard. A comparison of this study with other studies shows that physicians’ knowledge of radiation doses and the risks of current diagnostic tests in Iran was not sufficient in 2016, and this can be improved through purposeful training (17). Salerno et al. (16) addressed the risks of children’s exposure to radiation among pediatric residents in Italy. They showed that physicians’ awareness of the non-ionizing nature of the MRI test was 79% and highlighted the need for implementation of protective training courses for physicians to raise their awareness in this regard. The results of this study are the same as that of the current study in terms of knowledge of the non-ionizing nature of MRI. Gunalp et al. (12) found that the knowledge of medical interns, residents, and radiologists in Turkey was not satisfactory. Similarly, Thomas et al. (11) stated that radiation from diagnostic imaging is an insignificant issue among physicians, and their awareness is poor in this regard. Unlike other studies, Heyer et al. (18) showed that the level of awareness of pediatric residents in Germany has increased. Soye and Paterson (19) admit that physicians need to be trained in diagnostic radiation. Keijzers and Britton (20) examined the knowledge of emergency department physicians and found that their overall knowledge of diagnostic imaging was poor. A study by Rahman et al. in Pakistan in 2008 on cardiovascular specialists during angiography and its protection showed that 93% of the sample knew about lead shields and used lead coveralls (21). A recent study in Italy showed that the knowledge of radiology specialists, radiology students, and medical students is limited with regards to protection from ionizing radiation (22). One important point to note here is that informing parents of the harms and risks of diagnostic imaging before performing tests on their children, should be considered ethically and legally. The questionnaire used in this study was confirmed to be valid and reliable and provides the basics for protecting children against diagnostic imaging tests. The participants surveyed in this study do not represent the entire medical population, yet given the high rate of answers to the questions, it is almost possible to say that statistics are consistent with reality. The results of this descriptive study showed that residents have a higher level of knowledge about pediatric diagnostic imaging radiation. Based on the results of this study, it is recommended to reduce radiation exposure of children, raise the awareness of general and specialized medical students at universities and hospitals through retraining courses, holding workshops and adding courses on radiation protection and the effects of radiobiology. The present paper was derived from a research project approved by the Office of Vice-chancellor for Research and Technology of Ahvaz Jundishapur University of Medical Sciences. The authors would like to thank the Vice-chancellor for Research and Technology and the Student Research Committee for supporting this project. Conflict of Interests: The authors declare that they had no conflict of interest. 1. Asano T, Sato K, Onodera JI. [United nations scientific committee on the effects of atomic radiation 2000 report]. Japan J Health Phys. 2001;36(2):149-58. Japanese. doi: 10.5453/jhps.36.149. 2. Meric M, Bor D, Büget N, Oezkili M. The use of Monte Carlo technique for the determination of tissue-air ratios (TAR) in diagnostic energy rate. Phys Med. 1998;14(1):3-8. 3. Peloquin JM, Pardi DS, Sandborn WJ, Fletcher JG, McCollough CH, Schueler BA, et al. Diagnostic ionizing radiation exposure in a population-based cohort of patients with inflammatory bowel disease. Am J Gastroenterol. 2008;103(8):2015-22. doi: 10.1111/j.1572-0241.2008.01920.x. [PubMed: 18564113]. [PubMed Central: PMC2831296]. 4. Mettler FA, Koenig TR, Wagner LK, Kelsey CA. Radiation injuries after fluoroscopic procedures. Seminars in Ultrasound, CT and MRI. Elsevier; 2002. p. 428-42. 5. Benini A. Medical radiation exposure, IAEA regional workshop radiation protection and quality assurance in diagnostic radiology. Nicosia Cyprus. 1993;12(4):14-25. 6. Hendee WR, Edwards FM. ALARA and an integrated approach to radiation protection. Seminars in nuclear medicine. Elsevier; 1986. p. 142-50. 7. Karam PA, Leslie SA. Calculations of background beta-gamma radiation dose through geologic time. Health Phys. 1999;77(6):662-7. doi: 10.1097/00004032-199912000-00010. 8. Kramer M, Scholz M. Treatment planning for heavy-ion radiotherapy: calculation and optimization of biologically effective dose. Phys Med Biol. 2000;45(11):3319-30. [PubMed: 11098906]. 9. Li LB, Wang JP, Yu XR, He SS, Yu FH, Ding CH. Medical radiation usage and exposures from medical X ray diagnosis in Shandong province of China. Radiat Prot Dosimetry. 2001;93(3):261-6. [PubMed: 11548352]. 10. Hill IT. The role of medicaid and other government programs in providing medical care for children and pregnant women. Future Children. 1992;2(2):134. doi: 10.2307/1602566. 11. Thomas KE, Parnell-Parmley JE, Haidar S, Moineddin R, Charkot E, BenDavid G, et al. Assessment of radiation dose awareness among pediatricians. Pediatr Radiol. 2006;36(8):823-32. doi: 10.1007/s00247-006-0170-x. [PubMed: 16699764]. 12. Gunalp M, Gulunay B, Polat O, Demirkan A, Gurler S, Akkas M, et al. Ionising radiation awareness among resident doctors, interns, and radiographers in a university hospital emergency department. Radiol Med. 2014;119(6):440-7. doi: 10.1007/s11547-013-0374-8. [PubMed: 24356945]. 13. Jacob K, Vivian G, Steel JR. X-ray dose training: are we exposed to enough? Clin Radiol. 2004;59(10):928-34. discussion 926-7. doi: 10.1016/j.crad.2004.04.020. [PubMed: 15451354]. 14. Behroozi H. Occupational exposure and mistakes in the wearing of film badges in computed tomography staff (1990–2009). Radiograph. 2014;20(1):33-5. doi: 10.1016/j.radi.2013.08.005. 15. Nickoloff E. Current adult and pediatric CT doses. Pediatr Radiol. 2002;32(4):250-60. doi: 10.1007/s00247-002-0677-8. [PubMed: 11956706]. 16. Salerno S, Marchese P, Magistrelli A, Toma P, Matranga D, Midiri M, et al. Radiation risks knowledge in resident and fellow in paediatrics: a questionnaire survey. Ital J Pediatr. 2015;41:21. doi: 10.1186/s13052-015-0130-x. [PubMed: 25881170]. [PubMed Central: PMC4391686]. 17. Zakeri F, Shakeri M, Rajabpour MR, Farshidpour MR, Mianji F. Physicians' knowledge about radiation dose and possible risks of common medical tests: a survey in Iran. Radiat Prot Dosimetry. 2016;172(1-3):311-6. doi: 10.1093/rpd/ncw175. [PubMed: 27522049]. 18. Heyer CM, Hansmann J, Peters SA, Lemburg SP. Paediatrician awareness of radiation dose and inherent risks in chest imaging studies-a questionnaire study. Eur J Radiol. 2010;76(2):288-93. doi: 10.1016/j.ejrad.2009.06.014. [PubMed: 19581064]. 19. Soye JA, Paterson A. A survey of awareness of radiation dose among health professionals in Northern Ireland. Br J Radiol. 2008;81(969):725-9. doi: 10.1259/bjr/94101717. [PubMed: 18591196]. 20. Keijzers GB, Britton CJ. Doctors' knowledge of patient radiation exposure from diagnostic imaging requested in the emergency department. Med J Aust. 2010;193(8):450-3. [PubMed: 20955121]. 21. Rahman N, Dhakam S, Shafqut A, Qadir S, Tipoo FA. Knowledge and practice of radiation safety among invasive cardiologists. J Pak Med Assoc. 2008;58(3):119-22. [PubMed: 18517114]. 22. Faggioni L, Paolicchi F, Bastiani L, Guido D, Caramella D. Awareness of radiation protection and dose levels of imaging procedures among medical students, radiography students, and radiology residents at an academic hospital: results of a comprehensive survey. Eur J Radiol. 2017;86:135-42. doi: 10.1016/j.ejrad.2016.10.033. [PubMed: 28027740].